Listening to Luke’s version of John baptizing in the Jordan in Norwich Cathedral this morning, I unavoidably had in my head Pasolini’s interpretation of this scene in his Vangelo secondo Matteo/ Gospel according to Matthew, partly because Luke repeats Matthew. For example for both writers the Pharisees are not just the opposition, the ruling class, but a “brood of vipers”. ‘Unquenchable fire’ in Italian is inestinguibile fuoco and John pronounces these words with rising passion. Except that the actor on the screen (Mario Socrate) does not pronounce them but someone else (Pino Locchi) in a dubbing studio. 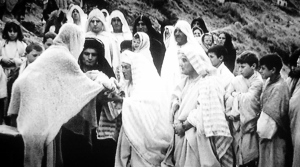 Such dubbing was common practice in post-war Italian cinema, and here it allows Pasolini to direct the voice to the right pitch of anger, creating a curious but effective disconnect between the image and the sound of the voice, partly because the synchronization of voice and lips is not absolutely perfect. In his mind, Pasolini is making of John a figure imbued with revolutionary anger, a Trotsky, a Che Guevara, in order to serve his picture of a gospel stripped of sentiment. My preferred translation of the Bible is the King James Version, but listening to Pasolini’s film has revealed to me the beauties and power of the version in Italian. Biopics are . . .
. . . all the rage: they feed our desire to know about the private lives of public people, a desire fuelled by new media. I went to a seminar last Saturday on biopics. We discussed Malcom X, I’m not there (Bob Dylan), Marie Antoinette, Citizen Kane (WR Hearst), All That Jazz (Bob Fosse), American Splendor (Harvey Pekar), The Iron Lady (Margaret Thatcher). Not all these films are ‘cradle to grave’ narratives, which I think would be part of the traditional definition of a biopic. Some so-called biopics just deal with a particular crisis in a public figure’s life, e.g. Spielberg’s Lincoln trying to get the Thirteenth Amendment to the US constitution through the House of Representatives – and let’s include at this juncture Ford’s outstanding Young Mr Lincoln, dealing with Lincoln’s life as an obscure young man. Or The Queen, focusing on the crisis in the UK monarchy at the time of the death of Princess Diana. Definitely not a biopic. 1 Shakespeare is our fore-runner here: ‘Richard II’, ‘Henry IV’ 1 and 2, ‘Henry V’, ‘Henry VI’ 1, 2 and 3, ‘Richard III’. These are all ‘bio dramas’ of a kind. ‘Henry V’ is the most ‘cradle to grave’ narrative because we see him as a young man in ‘Henry IV’ and as a king in ‘Henry V’. ‘Richard II’ is the exception: the play revolves round the abdication crisis at the end of his reign. Yet really the drama of Shakespeare’s history cycle is about kingly mortality. We see all these kings die (except for Henry V) and ‘Richard II’ discusses the subject at length. 2 Shakespeare’s plays serve the purpose of Tudor propaganda, which raises the point that all biopics have an agenda to promote. It might be inspirational (Selma), it might be the opposite (Citizen Kane). One of the propaganda purposes of Hollywood biopics is to trumpet American greatness. But it is in fact in an American film that this tension between presentation and actuality, between surface and substance, between fiction and truth, has been most profoundly explored, not in a biopic but in a narrative that sheds much light on the genre: John Ford’s The Man Who Shot Liberty Valance. 3 We should not lose sight of the fact that there are biopics from other countries: Tarkovsky’s Andrei Roublev for a start (which has its own agenda about Russian greatness, among other things). There’s Andrzei Wajda’s Walesa, a companion piece to Man of Marble and Man of Iron, the three making a sort of Solidarity trilogy. Only with Walesa: Man of Hope, the third film, does Wajda deal with historical people. Ireland’s Neil Jordan has made a very good fist of Michael Collins’s story in his film of that title. I thought too of Francesco Rosi’s dissections of power in Lucky Luciano, a gangster biopic. More propaganda of a kind. And then there is Sorrentino’s Il Divo about the long-serving Italian politician Giulio Andreotti, further analysis of the corruption of power. Like the Bob Dylan biopic (I’m not there), very difficult to follow if you are ignorant of the subject, but rewarding perhaps if you do. 4 Thinking about the biopic as propaganda brought to mind a favourite biopic of mine: Pasolini’s The Gospel According to St Matthew, a true cradle to grave narrative. It gets my treatment in ‘New Filmgoer’s Guide to God’. 5 The biopic I’d like to see made is on the Czech president following the fall of Soviet Communism, Václav Havel – see http://www.timcawkwell.co.uk/vaclav-havel. Christmas approacheth. It feels an appropriate moment to refer to Pasolini’s version of Matthew’s gospel, made with a striking fidelity to the text. Like the Renaissance painters to be counted among his forebears, Pasolini knew the story intimately. The Nativity in Matthew just involves the kings, or better magi, so no shepherds. The second image shows a touching moment, a scene imagined by the film-maker without contradicting the spirit of the words, in which Mary passes her baby to one of the magi for him to hold. “What are the qualities of Il Vangelo secondo Matteo, in English The Gospel according to St Matthew (although Pasolini was strongly irritated by the addition of ‘saint’)? At first sight it has an astonishing closeness to the text, so that for the Christian believer the sacredness of the book is profoundly respected, but it also is the work of a literary man with a remarkable gift for visual images. In this ability to combine the worlds of words and of pictures Pasolini echoes his Renaissance fore-runners such as Da Vinci, Michelangelo and Alberti: besides writing novels and poems, he was an intellectual and semiologist, he wrote a book about Italian paintings, he drew (an exhibition of his drawings was held after his death), he had a passion for music. The Gospel brings these elements together more than any other of the many creations in the packed fifty-three years of his life. “In order to visualize the Gospel, he first thought to film it in Palestine but after a visit rejected this as unsuitable, settling instead for the rugged landscapes of Apulia, Calabria, Basilicata and Catania in southern Italy. For Jerusalem he used the old part of Matera near Taranto. This unfamiliar, impoverished Italy is arresting in itself, and its buildings made an archaic and intangibly appropriate setting when compared to the papier mâché and plywood buildings of the Hollywood epic. But his creative imagination did not insist on some documentary adherence to the dress of the first century AD (assuming that such dress, whether military, royal or peasant, could be objectively determined). Instead he sought inspiration in painting, especially of the Renaissance: hence the Pharisees’ hats and the garb of the Roman soldiers are from the paintings of Piero della Francesca, the pregnant Mary is a Renaissance Madonna, and, so Pasolini claimed, ‘Giotto and Norman sculpture were in the background.’ He even adopts the visual trick of showing people with their bodies foreshortened by the camera (Herod on his deathbed, John in prison) as if the Renaissance fascination with perspective could become the film-maker’s as well. Next entry will be on Rossellini’s Messiah.